Hello, everyone! 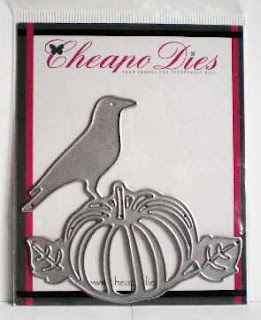 Welcome to Friday and my first time sharing as a new member of the Design Team for Cheapo Dies. 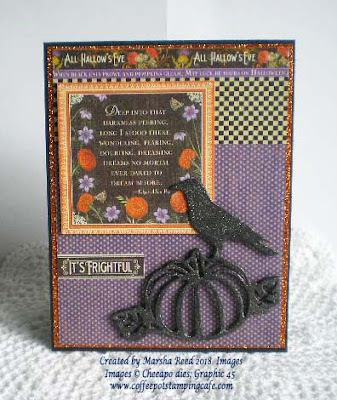 The die I'm featuring today is the Pumpkin & Crow die. For my card, I cut out three of the images and glued them together to give some dimension to the die-cut. To the black card base, I attached a piece of Copper Glitter Paper. Going through my Graphic 45 stash, I came across these various patterned papers that all worked well together so I layered them on top of the glitter paper. To give the pumpkin and the crow a bit of sparkle, I covered them with Clear Wink of Stella. If you are not familiar with Cheapo Dies, here's where you can go to check them out. Thank you for stopping by today. Be sure to come back daily to see all the wonderful projects the Design Team creates using these fun dies. Great way to use that die. I like it just cut in black. Fabulous card and the die cut in a vintage look black, well like I said FABULOUS! !